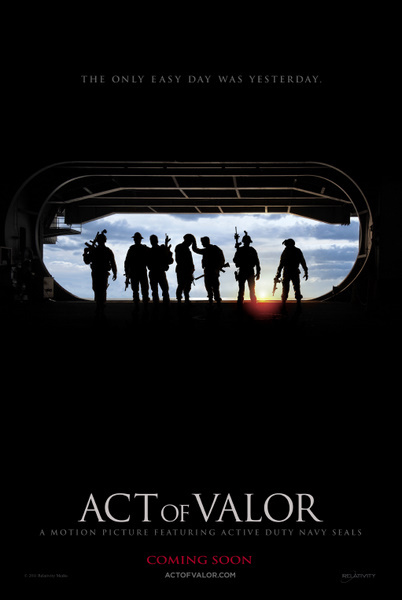 Here is the official One-Sheet from Relativity Media upcoming film ACT OF VALOR . The film is directed by “Mouse” McCoy, Scott Waugh starring Active Duty Navy SEALs, Roselyn Sanchez, Alex Veadov, Jason Cottle, Nester Serrano. An unprecedented blend of real-life heroism and original filmmaking, Act of Valor stars a group of active-duty Navy SEALs in a powerful story ofcontemporary global anti-terrorism. Inspired by true events, the film combines stunning combat sequences, up-to-the minute battlefield technology and heart-pumping emotion for the ultimate action adventure. Act of Valor takes audiences deep into the secretive world of the most elite, highly trained group of warriors in the modern world. When the rescue of a kidnapped CIA operative leads to the discovery of a deadly terrorist plotagainst the U.S., a team of SEALs is dispatched on a worldwide manhunt. As the valiant men of Bandito Platoon race to stop a coordinated attack that couldkill and wound thousands of American civilians, they must balance their commitment to country, team and their families back home.